Thinknet » Namesake answer: Which is a touchier subject: religion or politics? Namesake answer: Which is a touchier subject: religion or politics? Which is a touchier subject: religion or politics? Reading what has been said up till now I would like to frame this in terms of what Nietzsche saw as his greatest discovery, which is the Value of Value. For him this opened up a whole new way to look at everything. For instance he looked at the evolutionary value of truth and discovered that lies can be valuable for survival too. In both religion and politics there are values at stake. Religion is more intense than politics, but for some people both are lightning rods. And lets bring into this Plato’s divided line that contrasts Ratio with Doxa. Doxa is divided into grounded and ungrounded opinion (appearance). 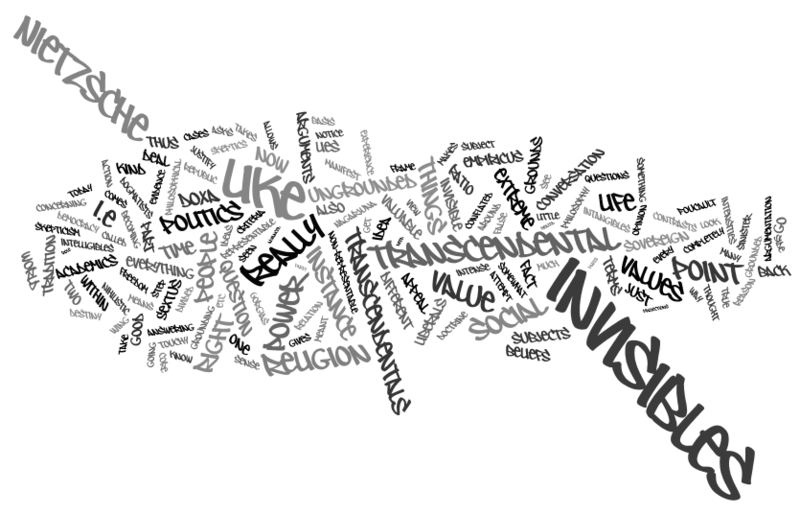 Religion is about invisibles that are transcendental which seem to control our lives, and Politics are about social invisibles that are about Power as Foucault would say. Power is a social commodity but it is ethereal within societies institutions. So in both religion and politics we are talking about ungrounded opinion concerning invisibles that relate to our values. But Nietzsche asks what is the value of those values? One response to that is existentialism, i.e. the value is questioned because it is about invisibles and how you feel about those invisibles from your psychological stand point, when you realize that they are your own projections and are in fact really meaningless, except for the social ramifications if your views are unpopular, and there are repercussions for that you have to deal with. So really the question comes down to two intensities of doxa. Now notice that the most intense arguments are where the invisibles are transcendental instead of social and where there is no grounding in experience for the beliefs. We can step down from this by making the point of argumentation about invisibles about social invisibles like power, or by appealing to some grounds, like archeology in the holy land. But transcendental invisibles are much harder to deal with because there is no grounds that you can really appeal to, and so those ideas really have little to do with experience, but Nietzsche asks what the role of these extreme ideas in relation to life, and he sees them as supporting life by giving us lies to hang on to when we are uncertain about everything, and thus cannot act. Believing these lies for him was part of a fitness function because these extreme beliefs in ungrounded doxa concerning invisibles gave us a basis for action, and that was supportive of life itself. He also tries to reverse the idea of Hegel that only slaves can be self-conscious, by developing a possible grounds for the action of the Nobility, in his idea of the blond beast. But ratio also has its extreme which is when we appeal to non-representable intelligibles, like the good (human happiness, for instance), or Freedom (for whom, and who is enslaved by that freedom we claim? ), or Law and Order (constitution), etc. These intangibles are almost as hard to define and deal with as the transcendental invisibles. In the realm of representable intelligibles we have the arguments in science, which can still be vehement, but in terms of non-representable values we have things which we appeal to as criteria for judging other things, like Right (Rta, Arte) one of the core values of the Indo-European worldview. It originally meant something like Cosmic Harmony in the Vedas in Sanscrit. But now its lowest common denominator means something like correctness. But we have right and left conflated with right and wrong, i.e. Right Wing and the L word (liberal). Liberals are on the sinister side in terms of the conflated distinctions related to rightness. Right wing political campaigns play on this deep seated prejudice all the time. But they are on the sinister side because the liberals were against the sovereign and they eventually displaced the sovereign and formed a republic, and we have them to thank for the fact that we have democracy today, because they resisted and overthrew the sovereign. There are just a few original democracies and ours is one of them, along with the republic in Rome and natural democracy in Athens. In this sense we are all liberals. Religion is the touchier subject because it has no constraints on it being about invisible transcendentals that cannot really be grounded because they are completely invisible. If we go back to skepticism of Sextus Empiricus then he says that everyone agrees upon what is visible so all philosophical argumentation is about what is invisible. But he says that there are two main approaches to that invisibility which he calls Dogma or Doctrine, and the Academics that just deny everything. Skepticism of Sextus Empiricus has the goal of keeping the conversation going and avoiding these two nihilistic extremes that kill conversation. But for the skeptic it is OK to take any position that it takes to keep the conversation going, and so that is recognized as also nihilistic by the dogmatists and the so called “academics” but really he means sophists like Gorgias of Leontini. Skeptics sought a kind of calm or repose within the dialectic of the argument between themselves and dogmatists and academics like Nagarjuna or Gorgias who denied every transcendental on principle. Notice that this is precisely Hegel’s starting point in the Logic where he contrasts the Being of Parmenides and the Nothing of the Buddhists (Nagarjuna) and the synthesis of these is seen to be the becoming of Heraclitus. Out of that becoming comes determinate being, i.e. dasein as existent which Heidegger picks up and makes the core of his attempt to go beyond Subject and Object duality in Being and Time. But Nietzsche wants us to look at why both Religion and Politics are “touchy” subjects. And that is because they are both transcendentals of different degrees, and because you can have opinions about them which are completely ungrounded in any kind of empirical evidence, not to mention the lack of reasoning associated with these subjects in most cases. They are “touchy” subjects because they are extremely valuable, these transcendentals, because they drive life in absence of any other drivers. Anyway that is what Nietzsche thought. Hopefully this will provide some interesting background for further discussion. That is part of the point. They are different intensities of transcendental invisibles, i.e. God and Power within Society, cf. Foucault (who Dreyfus says just substitutes Power for Heidegger’s Being but has exactly the same theoretical structure). But the other point that Nietzsche makes is that there must be a reason we are driven by these transcendentals and so he looks to evolution and the affirmation of life as the source of ultimate value, rather than looking to the transcendentals themselves as most people do. Basically he takes the contradiction that many of the things we hold as true, are in fact false, based on some criteria, like the good for instance. These beliefs are seen as inherently true, and thus unquestionable (hence dogmatism) and so Nietzsche asked how come we do that. For instance we engage in horrendous wars in the name of Manifest Destiny. As a doctrine Manifest Destiny is a tautology that says that who ever is the most advanced and has the most power was meant to win and exploit others (called civilizing them). It is manifestly false and not good, but we use it to justify colonialism. Only after all the damage is done around the world do we admit that this was a mistaken idea. I have been trying to answer either a Quora question, or some question here at Namesake every few days. I plan to add G+ to that list, because answering questions there might actually get me a job (which I need). But I am happy to spend as much time answering questions, or creating conversations as I have time to do, because this kind of interaction is part of my “prime directive”. I believe that a lot of people mis-understand philosophy, and so I thought I would try my hand at turning that around if I can for some. Philosophy, gives you a view point on things that most people do not attain, and it allows you to see the world in different ways than are normal, and thus it allows us to escape the ritual debates and go somewhat deeper, for instance when we frame your question in relation to Nietzsche and the Skeptics like Sextus Empiricus. The tradition is valuable in this way, as it gives us some perspective. I wish I knew more of the tradition, but the little bit I know I am willing to share. If we could get people who really know parts of the Western Philosophical Tradition well then you would see that my take on things somewhat primitive in many cases. I am searching for a global view that helps to make sense of the world as we find it today.